If a girl can do it, then so can I. 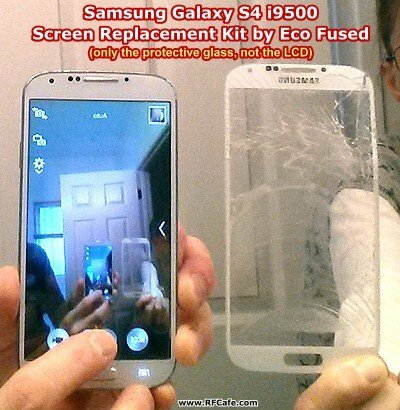 That was my thought after watching a video where Ally replace the protective glass on a Samsung Galaxy S4 smartphone (see below). Just kidding, of course, but I like to ruffle feathers. Anyway, my daughter, Sally, owns and runs a horse riding academy (Equine Kingdom) and does a lot of hard, heavy work that would exhaust many men. Her daily lesson scheduling is done with her smartphone. It spends most of the day in her pocket, or on the ground after being dropped. If anyone can break a phone being protected by an OtterBox, it's Sally, and she did just that. She thought the LCD display was broken, but fortunately it was just the protective glass cover on the front. Replacements cost $10-$12 on Amazon, but the procedure of removing the original glass without destroying the underlying LCD and/or touch sensor (digitizer) requires a level of fineness that most people are not willing to attempt. 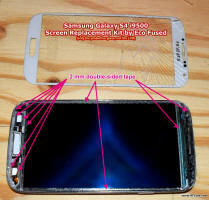 An entire replacement display assembly costs $175-$200. Most people live with the cracked glass since local repair center will charge somewhere just south of $100 to do it for you. 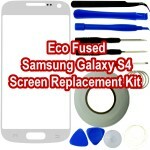 After watching a couple videos, I confidently ordered a glass replacement kit made by Eco Fused for a mere $20. It includes specialty tools that by themselves would cost more than $20 if purchased separately, including really nice tweezers (as if I need another pair!). 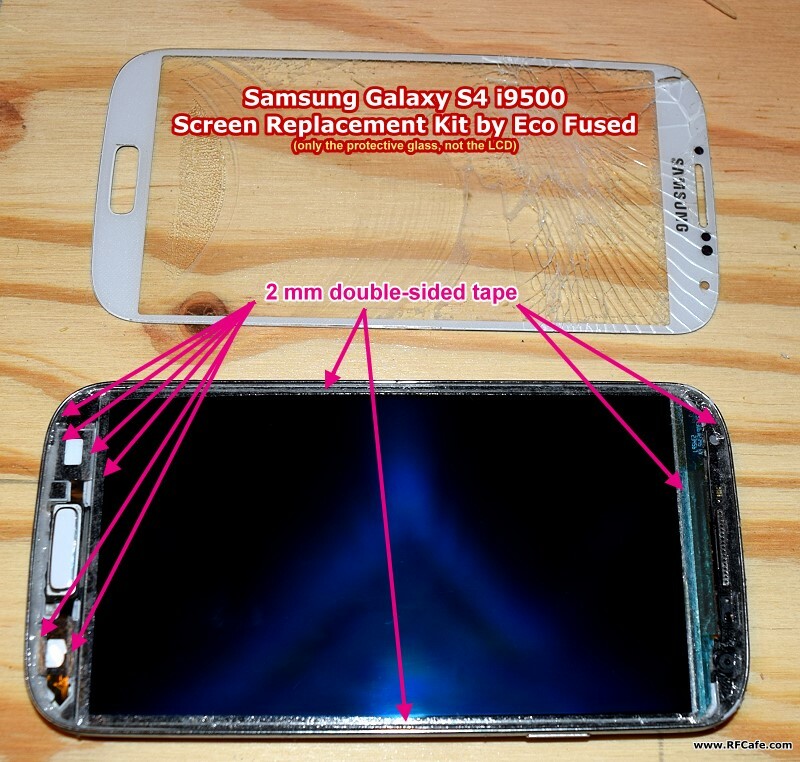 There are two types of repair; one involves re-gluing the glass to the LCD using UV glue, and the other uses double-sided tape. This kit uses tape. 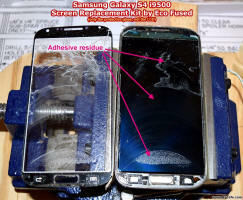 It's much less prone to screwing everything up after going through the grueling process of removing the old glass. A benefit is if the glass breaks again, it'll be much easier to replace. The bad (potentially) thing is if you don't do the cleaning and tape just right, the digitizer will not function through the non-bonded glass interface. After removing the phone's battery, SIM card and memory card, I lightly clamped the body in a heavy drill press clamp in order to hold it securely while not having to wear heat-proof gloves while softening the adhesive. The heat gun I've had for three decades and was made to shrink the Mylar covering (MonoKote) I use on my model airplanes did the job just fine, while a thermocouple attached to my DMM monitored the temperature to make sure I did not get above the 200°F maximum. An X-acto blade was used to pry up the top left corner of the glass and then one of the included plastic guitar picks as wedged under it to maintain an upward force. 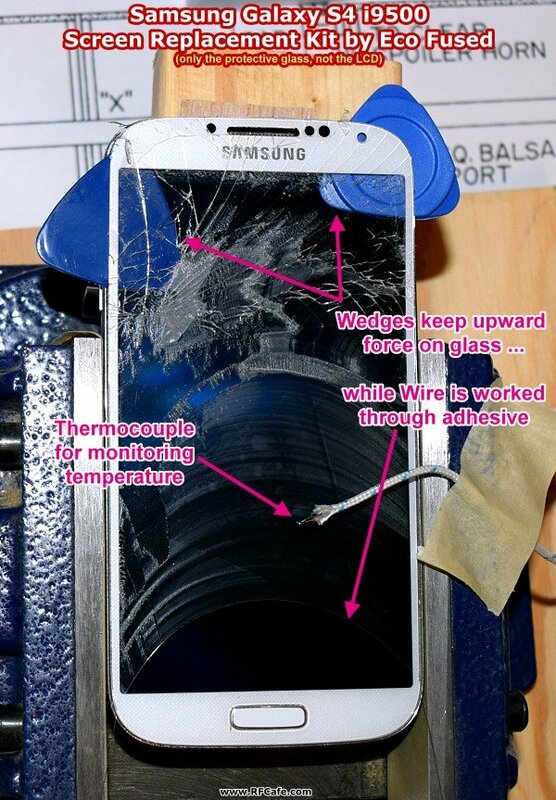 The included thin wire was then threaded under the glass and, along with a continual waving of the heat gun and monitoring the temperature, about half an hour later the glass was completely detached. It is a long, slow process. Most of the residual adhesive came off with cotton swabs (aka Q-tips) and isopropyl alcohol, but a couple spots were really thick so I had to use the heat gun and one of the plastic guitar picks to scrape it off. Then, alcohol easily took off the rest. All of the old glue had to be removed from around the case edges and around the switches, camera, speaker, etc. That was no big deal, but care was needed to not get alcohol into or on the accessories. A final cleaning with Windex left the LCD spotless and dust-free. The 2-mm double-sided tape was laid down along the perimeter and around the accessories as directed in the instructions. Finally, the replacement glass was set in place pressed down in the tape areas. I replaced the battery and cards, pressed the power button, crossed my fingers and held my breath. The Galaxy S4 booted up like usual, and all of the controls seem to be working as before. Finger swiping gestures and presses all appear to be responded to appropriately. It appears I managed to pull off a successful repair! Sally will certainly be relieved.